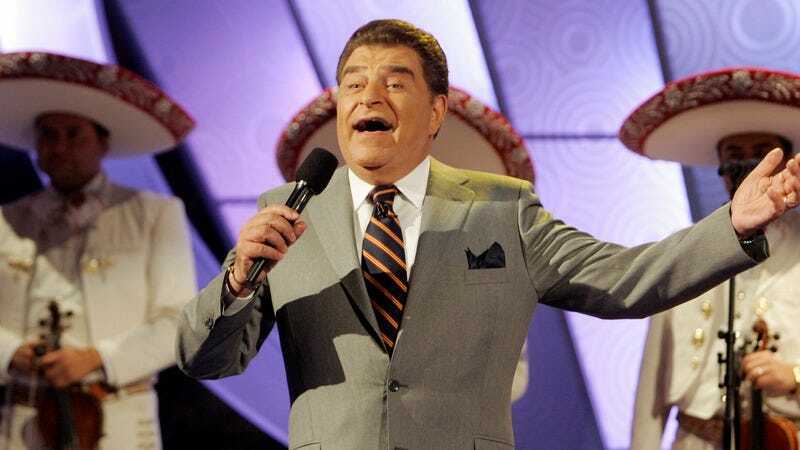 Sabado Gigante, the variety show that has entertained Spanish-speaking audiences for 53 years (and bemused English-speaking ones), is ending its increíble run, Univision announced today. The series—the longest-running variety show in TV history—has aired without fail across 3,000 Saturday nights full of zany comedy sketches, lavish musical numbers, wacky hats, and scantily clad dancers. And now it all comes to an end this September 19. Saturdays thereafter will be just a little less gigantic. Impressively, all of those Saturdays have been overseen by the same host, Chilean ringmaster Don Francisco, whose real name is the far less zippy Mario Kreutzberger. Beginning in 1962 under the name Show Dominical, Kreutzberger’s program combined his love of many different types of talk and variety shows from the U.S. and South America into one enormous, erratic spectacle. It quickly became a hit in Chile, moved to Saturdays (and underwent a name change), and slowly spread across Latin America thereafter. And after Kreutzberger relocated to Miami in 1986 and began producing it at Univision, it became a television staple for Hispanic audiences in the United States, whose devotion has consistently helped Univision land at sixth place in the 18 to 49 demo, every Saturday night. That’s all the more mind-blowing considering Sabado Gigante episodes typically run for an exhausting three hours. But Kreutzberger has always kept those episodes jam-packed, throwing everything from wacky beauty contest parodies to Price Is Right-style game shows to recurring comedy skits to musical guests into the colorful mix. He even manages to squeeze in serious interviews, like when he sat down with President Obama in 2010 (and Michelle Obama earlier this year). Even those who have never actually watched Sabado Gigante have probably picked up on its influence through parody, where it’s inspired things like The State alumni’s Viva Variety and Stephen Colbert’s The Colberto Reporto Gigante. According to Variety, the 74-year-old Kreutzberger plans to remain busy at Univision with new projects and by continuing to host various entertainment specials and telethons. But for the first time in five decades, he won’t be there for Saturday night.